I have been asked about this process a number of times even though, I've never tried it. It appears from the reviews I've just read that the two materials compliment each other very well in achieving strength, puncture resistance and rigidity. If we are to believe the claims, the process takes less time than tissue alone and the finished product ultimately weighs less because less dope is used. An online description by Mike Woodhouse of Free Flight Supplies in the U.K.
A build report on the Keil Kraft Senator seen above by Craig Limber. A forum discussion at Flying Small Arts. A PDF from the Pensacola Free Flight Team and another. And, last but not least, a review by Karl Gies of Lewiston, Montana. Hi Thomas, a couple of caveats, when you lay the tissue over the mylar don't try to wet a large area. Just a few panels and cover the tissue below it with something like a lightweight cloth. Then you can use kleenex to blot some of the water off the wet tissue if you get it too wet. You want the tissue to be wet when you brush the dope over it. You will get some blushing but one coat of thinner or real thinned down dope will get rid of it. Do not try to stretch the tissue until it is real tight and looks perfect. Just get out the big wrinkles. I go over the mylar that is on the model with dope on the edges or better yet a purple glue stick, let it dry and then put the tissue over it. After I get the tissue stretched out I go around where I put dope or glue stick and brush thinner through and rub a finger over it. That way it will not curl back on you. cheers, karl p.s the velcro cement is the only way to go to attach the mylar to the model. Thin it down 50/50 with nitrate thinner. Let it dry real good and then lay the 1/4 mil mylar down. This following covering method is a compilation of what many modern day old-time rubber modelers now use, plus my personal experience. You cannot go wrong following this. Oh, yeah! Tissue over Mylar has many advantages over just straight tissue but still retains that great Japanese tissue look. Others more empirical than me have done weight tests and tissue over Mylar is generally lighter or about the same as just doped tissue due to the fact you do not need much dope. The combination of Mylar/tissue is tough, probably 50 times tougher than just tissue, and the tissue won’t sag in high humidity or early morning dew. This 2-step covering method is not only a lot tougher than just tissue, but as light or lighter because you only need one or two coats of Nitrate dope on the tissue. Dope is heavy. This is what I learned from using Mylar covered with tissue and it is a great way to go. I do not use the iron-on self-stick Mylar on the advice of others. I made some test panels and I highly recommend this before trying it on a model. DO MAKE SOME TESTPANELS FIRST, IT WILL SAVE YOU A LOT OF GRIEF! I just used scrap balsa, stout stuff like 1/4" square to make some squares. On smaller models like rubber jobs I use 1/4 mil (.00025) Mylar. Others use this method on big gas jobs but use a heavier grade of Mylar. First, give the balsa area that the Mylar will cover a couple of undercoats of 50-50 thinned nitrate dope. For the actual Mylar adhesive I first tried thinned down contact cement - it gets globs in it and it’s hard to thin. 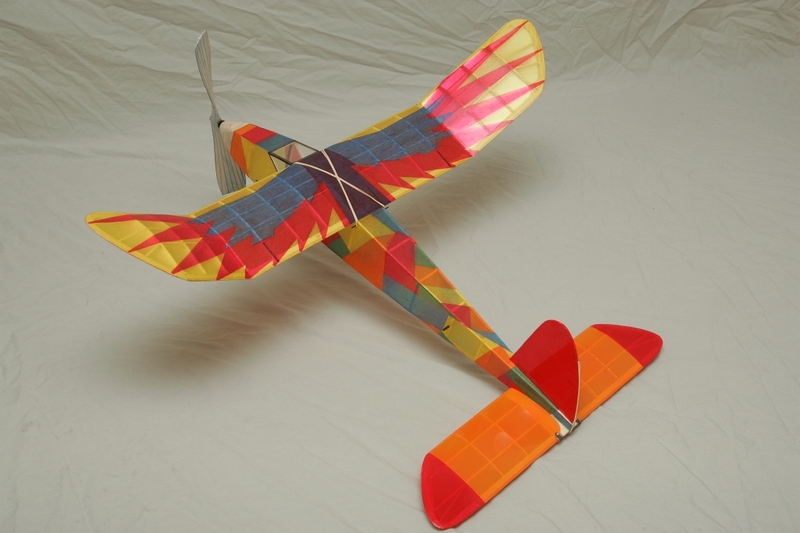 You have to avoid getting the globs on the balsa wood. Next I tried Balsaloc, also Sig-Stix-It, and brushed onto the balsa to adhere the Mylar, but once you hit the Mylar applied over this stuff with the heat iron you cannot reposition the Mylar. I now use Velcro cement thinned 50-50 with nitrate dope thinner, it works great. You can get the Velcro cement in small tubes at any sewing shop. It’s just a finer grade of contact cement but does not clump up much. I use nitrate dope thinner to thin it down about 50/50. Plug in your iron set on medium. I use a Monokote trim iron. Brush the Velcro adhesive, thinned (50-50) with Nitrate dope onto the balsa. Then when it is pretty much dry, just a slight bit tacky, lay the Mylar over the portion of your structure to be covered. Pull and tug until you have it fairly even and tight without too many wrinkles. Iron on the Mylar with the iron set on medium heat and it will adhere. After a few minutes go over the top of the Mylar with the iron- not touching it, until it shrinks, and it will shrink. Mylar will not work on lightweight stabs and fins, it will twist them. You can use it, just don't shrink it on the tail feathers. Now for the tricky part, putting the Jap tissue on the Mylar. I was told that on the longerons you had to leave part of them bare to get the tissue to stick. Well this will not work very well w/say 1/16"square longerons, too tricky. On my test panel I went around the edges of the balsa square w/a bead of full strength non-taughtening nitrate dope...do not use butyrate, because it will really shrinks the heck out everything. Let the dope dry...or use a bead of purple glue-stick which dries clear, this works really great. I then cut out a larger square of tissue. I put the tissue on the Mylar fairly wet, by first laying it on a towel and spraying it with rubbing alcohol. I’ve also lightly sprayed it with water, if I got it too wet I’ve left it on the towel and lightly blotted it w/another towel. If the tissue is thoroughly wet when you brush the thinned down dope over it (50/50) it will really smooth out. I use non-taughtening nitrate dope only to adhere it and have never tried butyrate. Butyrate would shrink it too much. Pick up the moistened tissue and lay it over the structure covered w/Mylar. Pull and tug until it looks pretty good and then brush thinned (50/50) non-taughtening nitrate dope over the area avoiding the edges. When you dope the tissue onto the Mylar use non-tautening nitrate dope if possible. Heating the Mylar will give it all the shrink you need. This gets everything stuck down and then I let it dry. I then tried a test panel rubbing the edges with a purple UHU glue stick instead of the straight dope. Went through the above process again, brushing thinner through the tissue on the edges to adhere the glue stick. As a precaution I lightly went over the edges w/the trim iron. This worked very well also. When I covered the Scientific "Major" I covered the entire fuselage sides, cabin area included, with Mylar, this made it easier. After I put the tissue over the Mylar including the cabin window area I let it dry and then with a double edge razor blade I cut out the tissue/Mylar where the windows would be. 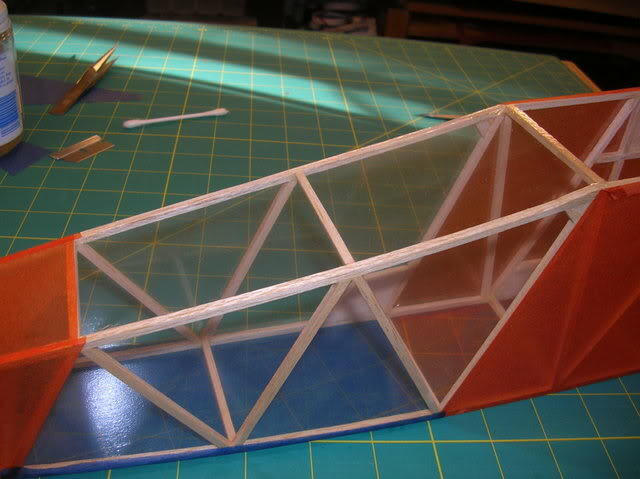 I then made a pattern where the windows are, laid it over a piece of Mylar and cut it out to fit except for the fuselage edges, let this be oversize to have something to pull on. I then very carefully went around the window edges w/the purple glue stick, let it get real tacky, then positioned the Mylar correctly, rubbed w/my finger and then again touched the edges w/ the iron on medium. I then used the iron to shrink the window area and ended up w/windows that were perfect and light, much lighter than celluloid. I could see the color of the tissue underneath the Mylar but then cut out thin strips of tissue, put some glue stick on the uprights and window edges, and laid the cut out strips down. I use a pattern to cut curved strips if there is a curved area. After rubbing the strips down I again lightly touched the tissue w/the trim iron on medium. This turned out to be the best window job I have ever done. I did not do anymore doping but you could if it does not look good. It is not necessary except from an aesthetic standpoint. For models just covered with Mylar, and no tissue over it apply a piece of Mylar snugly over a test panel spray it w/Design Master Floral spray paint with the color you intend to use on a model to see how it looks. I just laid the test panel on a newspaper and gave it several light coats of Design Master. It will never be opaque, and the end result looks like see-through colored Monokote. It will definitely not have a vintage look! I just built another AMA Maxi Jr., a simple solid stick fuselage model (like the standard ROG but w/no landing gear). This model has a wing with ribs. I did not worry about the vintage look, not a vintage model, just wanted it light and of course not invisible in the sky from using just the clear Mylar. I sprayed it with Design Master floral paint and it came out very light, somewhat lighter than the Japanese tissue covered one that I lost last summer. I also covered the tail feathers with colored Mylar but only hand tightened it as the iron shrinking process would pretzel these parts. The end result is a very light, good-looking, highly visible model. Here’s the technique to use spraying Design Master Floral spray paint over Mylar. Place a piece of Mylar on a frame, stuck to the edge of the frame, and do not heat-shrink it, just pull it tight. Spray several light coats of the Design Master Floral Spray and when dry cut the Mylar off the frame. Apply the Mylar to the structure so that the colored surface is on the inside. I did this and it works great. This way the colored surface is on the inside and the paint cannot be rubbed off. Design Master Floral Spray Paint can be obtained at a Michael's Craft store (nationwide chain) or art supply stores. It’s available in a lot of colors. It is mostly propellant and is light stuff. You can spray some Krylon clear over it as a fixative without adding any appreciable weight.